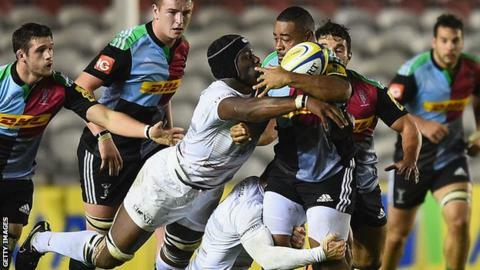 Rugby Football Union chief Steve Brown has called for stricter rules to prevent nations from selecting players nurtured through the English system. Scotland named 10 uncapped players in their recent squad, including London-born Darryl Marfo, Carlisle-born centre Chris Harris and former England Under-20 player Nathan Fowles. Brown said: "That's a real challenge, with the way the borders work. "We have a job to do. There are maybe some regulations that are required." He told the BBC: "Are there rules and regulations that could restrict the selection of those players given they have been in an English academy system for some time?" Marfo, 26, qualifies to play for Scotland through his Ayrshire-born mother and Edinburgh team-mate Fowles has a grandfather who was born in Edinburgh. Newcastle centre Harris, who played for England Counties, also has a grandparent from the Scottish capital. From 2020 players will have had to live in a country for at least five years before being eligible to play for their national team. Scotland head coach Gregor Townsend, speaking the BBC Radio 5 live's Rugby Union Weekly podcast, said: "There are more and more top quality players coming through, but we can't just restrict ourselves to Scotland. "There are a number of Scots who leave the country to work in London, to work elsewhere in England, have children, and still feel very Scottish. "Players that are qualified by birth, or qualified through grandparents, we have to make sure we are aware of who they are and that they are aware of the opportunity they have playing for Scotland." Last January, a study by the Daily Mail revealed 25% of the players in the respective 2017 Six Nations squads were not born in the country they were competing for. England chose seven players who were born outside of the country, while Scotland had 18.